Comic enthusiast and passers by took a glance at the Midtown Comics comic book store on west 40th street once they realized they can receive a package of comics for free. 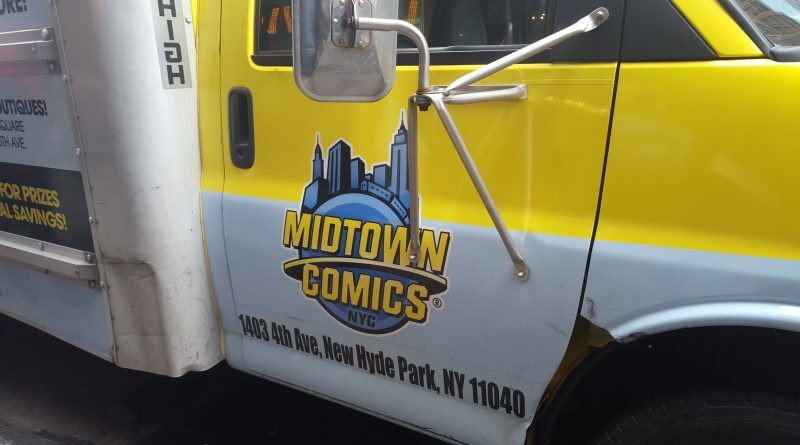 A Yellow truck filled with tall brown packages stood inside of the Midtown Comics themed truck with employees eager to relinquish their supply. “Make sure you go to your local comic shop on Free Comic Book Day” said the CO-publisher of DC comics entertainment Jim Lee using Youtube. Every first Saturday in May, Comic distributors publish specifically featured comic books to give out to the public. This event allows persons who are not accustomed to comic culture a chance to own their own work of art. Artist and writers alike made sure to encourage the public to visit their local shop and support the event. “On the first Saturday in may I’ll going to be at my comic book store for Free Comic Book day. You have to check it out. You get free comic books. Every body is there, it’s a great time.” said artist and writer Sam Humphries on Youtube. An accumulative of 6 million comic books were sent to comic book stores across the country. A couple of the comics including All-New All Different Avengers Civil War 2 and Suicide Squad received the spotlight on this event. With the Captain America Civil War in theaters and Suicide Squad film arriving in theaters on August 5th, the comics share with readers possible events that may occur in the cinematic universe. The Suicide Squad comic created by Adam Glass, Marco Rudy, and Ryan Benjamin gives readers insight on how the group of misfits and villains became a classified team. Gory and visually graphic details make this comic rated T for teen and lets the reader in on some reasons as to why the team is being integrated. The expert hit man/ marksman Deadshot receives some of the spotlight with a flashback on his encounter with Batman and a missed target. Harley Quinn showcases front and center of the comic’s cover. Her character grew to be a fan favorite and her relationship with The Joker makes her a questionable force in the comic and Suicide Squad film. In an interview with the FCBD association, Brian Michael Bendis talks about his first issue of Civil War 2 as a whole new and pact story plot to follow. Civil War 2 includes many of the Marvel characters including War Machine, Ms. Marvel, She Hulk, and the maniacal Thanos. This first instalment of the series presents in a vivid detail a battle between Thanos and the All-New All-Different Avengers that leads one of our heros in serious danger. Another interview held by the FCBD association talked with Greg Grunberg and Lucas Turnbloom about their comic Dream Jumper. “Dream Jumper is a series that follows Ben, a young boy who discovers very quickly that he has the power to jump in and out of his friends dreams and nightmares and help them battle their worst fears.” said Grunberg. Dream Jumper is a kid friendly comic and carries a serious moral focus for readers. Grunberg goes on to talk about the wide reach of his comic to all audiences and how in-depth the storytelling grasps the reader’s attention. The FCBD community encourages others to share their experiences with their grabs every 1st Saturday of may using #FCBD. ← Q&A: York College Student Overcomes Undocumented Citizenship Issues.